Working on your body offers numerous benefits for both your body and mind. Various workout routines focus on different goals. Yet, when it comes to bodybuilding, people tend to get lost due to the variety of exercises. There are many types of exercises which are important for proper muscle building, but 4 are the most basic ones and they must be included in your workout routine. These exercises focus on core elements of your body, which are going to create an impeccable foundation for a vast variety of other exercises. It is important to say that you should never skip doing these exercises as they will speed up the process of your bodybuilding progress. This exercise is essential for front-upper-body muscles. Specifically, chest and shoulders muscles. Push-ups are good for beginners, but sooner or later, in order to make further progress, it is essential to move to the bench press. The reason for this is because it is simply easier to reach a higher weight that will specifically hit chest and front shoulder muscles among others. A supporting muscle group in this exercise are triceps, which will also tone better as the weights go up. The perfect beginning goal for the bench press is to be able to lift your own body weight. Every weight that exceeds your body weight will offer superior results and it takes some time to reach those weights. There are 3 most important variations of the bench press exercise. The difference lies in the angle, while lifting the weights. 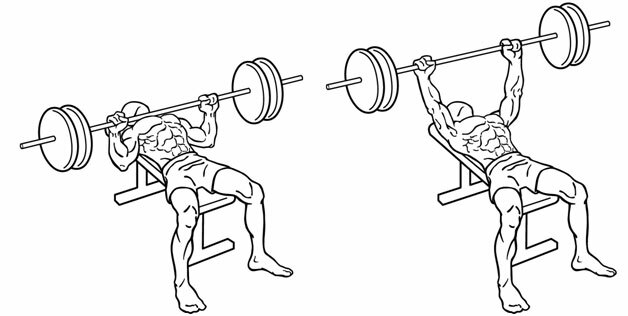 There is the normal, decline and incline bench press. All of these variations engage chest muscles in different ways. Incline is focused on upper chest muscles, normal is for the middle and lower parts of your chest and the decline variation focuses on the engagement of lower chest muscles. When you make noticeable progress, it is important to do all three variations regularly in order to tone your chest muscles in an appropriate way. This is the ultimate exercise which strikes almost every important muscle in your body. People tend to avoid this exercise because it requires good form in order to avoid injury. It is very important to include this exercise as it will improve the strength of your whole body. The muscles involved in lifting the weights are quadriceps, abdominis, biceps, trapezius and the list goes on, as you can see in the provided photo. The only thing you have to worry about is, like with other exercises, perfect form. Appropriate form while doing this exercise will ensure the right engagement of every muscle and it will lower the chances of being injured. 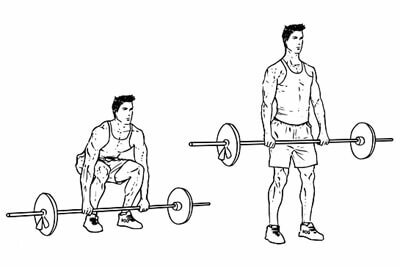 When it comes to variations, there are plenty different deadlifting techniques. Each is specific in its way and they activate similar muscle groups in a different way. The most popular are rack pulls, sumo deadlift, trap bar deadlift, romanian deadlift and kettlebell sumo deadlifts. These variations are essentially going to give similar results but some people simply feel more natural with a specific technique. The best thing to do is to mix all of the technique over a great period of time. This will activate your muscles in a different way and positively affect your further progress. This exercise is absolutely necessary in your workout regimen for many beneficial reasons. It is perfect for the engagement of leg muscles and it requires a wide range of other muscle groups which work as stabilizers. Many people ignore doing legs in their workout plan which leads to a very noticeable disproportion of upper body muscle size and leg muscle size. Beside the noticeable disproportion, building some muscles and ignoring others can lead to serious injuries which will tremendously slow down your body building process. This exercise will provide great strength and muscle size in your lower body. 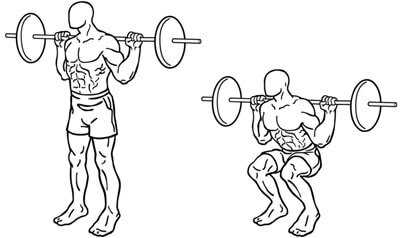 In order to achieve future progress and stability, the two popular techniques you should master are the goblet squats and landmine squats. These two variations will put less stress on your lower back and knees but will still greatly affect the quads and gluteus. When you master the perfect form and increase weights, you can move on to doing classic squats with weights on your shoulders. This exercise is for those who master pull-ups. Lat pulldowns offer higher weights which specifically strike your upper back muscles. This is a very important exercise as back muscles should stay in balance, size-wise, with front chest muscles and vice-versa. 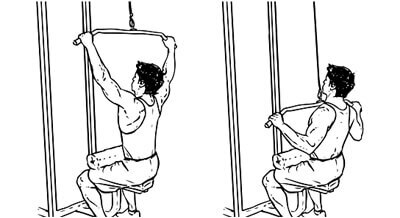 This exercise should only be done if you are doing a great number of pullups. These 4 exercises are essential for building and improving your overall body strength and muscle mass. With an appropriate workout plan which includes these exercises, you will achieve the goal of having a strong and well-balanced body.